Showing results for tags 'Scootaloo'. In this episode, Rainbow Dash's parents discover she's a Wonderbolt and start showing up at every event to cheer her on. However, their unbridled enthusiasm embarrasses Rainbow and pushes her to the brink. . The episode aired Saturday 11:30 AM EST on May 20th!! This thread is dedicated to discussing the episode before, during, and afterwards. As the thread is now open it may indeed contain spoilers. I ask that potential spoilers talked about or shown before the episode airs stay within the spoiler tags please, after the episode you no longer have to use the spoiler tags, but warning, if you haven't seen the episode yet after it airs, this thread no doubt will have all sorts of spoilers in reviews, images, etc. So tread at your own risk. 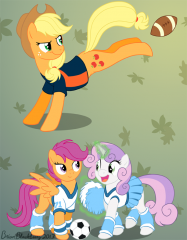 how scootaloo and rainbow dash meet each other? © Can use the image, but not make money off it in anyway. The day had finally come. The day Twilight had always dreamed of! The day when she would get to do one of her favorite hobbies to a few fillies and colts. On this day Twilight gets to read to a few lucky fillies and colts of Ponyville in her very own Library. She was so excited she could hardly contain herself! She had spent a few hours of her day cleaning up the library and making it perfect for the kids when they arrived. She wanted them to WANT to come back because who knows, she may do this again if the kids like it. Though she was a bit nervous about reading to kids she wanted to make a good impression. She knew almost all of the kids but she wondered if any new ones would show up today. Twilight then quit worrying about her impressing the kids and decided to get ready. It was almost time for the kids to arrive. So Twilight went over to the area she had set up in the Library. She had a seat for her and a blanket set up on the ground and a few cushions for the kids to sit comfortably on. She also had a small stand by her chair for the book of choice to rest. That was it. The book. Daring Do and the Quest for the Golden Statue. She had a few more Daring Do books but she chose this one because she thought it would be best. As she looked it over she saw Spike out of her peripherals. [colour=#800080] "Hey Spike. Do you think the kids will enjoy this book? "[/colour] She didn't look at him but she still awaited his answer. No answer. [colour=#800080]"Spike? "[/colour] She still didn't look and still no answer. This time she turned her head and saw that Spike was gone. She huffed and turned her eyes back to the book. [colour=#800080]"Whatever. I know the kids will like this book. "[/colour] She gave the book a nice smile and then looked up. She looked towards the door and figured she would go and open the door so ponies would know she was home...or something. She didn't want anypony to get lost on their way here. But she really had no idea how anypony could get lost on their way here but anyways. She trotted over and opened the door and to her surprise there were two kids already there. One looked as if he was about to knock on the door. There was a filly and a colt. She knew both of them. 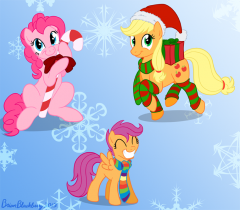 ((OOC: Best banner ever. 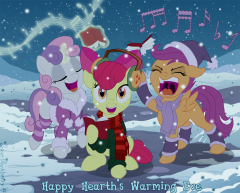 Thanks Jane )) ((OOC: I have no idea how large the Scootaloo image is so if it is ginormous then apologies )) Shady and Scootaloo decided to come to Twilight's book reading today. Well they both actually really wanted to come today. They heard about it in class one day and then they both met after school and decided to go. 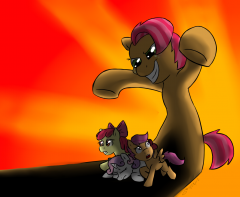 Scootaloo had no idea if any of her fellow CMC were coming. But she was sure if they did they would love the story. Once they reached Twilight's house they both looked at each other. Shady was the one who decided to knock. But just when he did the door opened and Miss Sparkle was there in the doorway. [colour=#800080]"Oh well hello there!" [/colour]She gave both of them a friendly smile. [colour=#800080]"You two are here for the book reading correct?" [/colour]She tilted her head to the side and gave them both a raised eyebrow in question. Shady and Scootaloo both looked at eachother and then nodded at Twilight. "[colour=#000080]Yes Ma'am we are!" [/colour]Shady gave Twilight a friendly smile. Scootaloo then jumped in front of Shady and gave Twilight her wide eyed eager face. [colour=#ff8c00]"Is it true? Are we reading a Daring Do book?" [/colour]She started to bounce a bit at her own excitement. Shady eagerly looked at Twilight and hoped she said yes. If she said no then he would be severely disappointed. Twilight noted their eagerness and couldn't help but giggle at it. [colour=#800080]"Why yes you heard right. Come on in!" [/colour]She opened the door wider for Scootaloo and Shady to enter. Both of them looked at one another and each gave a wide eyed and opened mouth expression. They then ran inside and stopped once they got in. Scootaloo was in front of Shady and she stopped first which caused him to fall over. They both then saw the area where they were pretty sure the reading would take place. So they both trotted over to the area and took a seat by each other. [colour=#ff8c00] "I'm so excited!" [/colour]Scootaloo was only really excited because she knew that Rainbow Dash loved Daring Do. And anything Rainbow Dash loved, Scootaloo must love. She made a few squeaks and waved her hooves around a bit. Shady smiled at her and laughed. [colour=#000080]"So am I! "[/colour] They both laughed and then waited, not so patently, for the reading to start. Twilight was standing by the door awaiting more kids to arrive. Cherrilee stood in the front the desks in the school building. She was ready to get her school day started, like always. She knew that every day would always different because of her wonderful students. They always brought smiles on her face and great joy in her life. She also loved how she felt like she brought joy into her students lives by teaching them new things and that they retained the information. Well, she hoped they retained the information. Cherrilee moved over and scooted one of the desks over so it was straight with the other rows. It didn't bother her that much because she knew that it would probably just get moved again by one of her students. But then again...it didn't bother her. Once the seat was moved she looked down at the ground and noticed a student's folder was on the ground. She rolled her eyes and gave the inanimate object a half smile. She huffed and leaned down and picked the folder up. She brought it over to her desk and laid it on the front of the desk. She hoped that once the students arrived the right one would pick it up. She then took her eyes away from the desks and moved them towards the clock. She noticed it was about that time so she moved towards the front door of the schoolhouse and propped it open to look outside. She stood in the doorway and decided to wait here for her students. She would greet each of them as they came in as she always does. It was time to start class. (Thanks Jane for the amazing Banner! )) Shady just got done with his morning preparations and was ready to head out the door to go to school. School. He loved school. It was where he got to see his best friends and Miss Cherrilee. He loved it everyday. He worked on the newspaper staff as well so he got to go to the basement a lot so he felt like a special pony. Shady grabbed his bag and gave it a quick check for his school supplies. Everything was there! So Shady waved goodbye to his parents and headed out the door. He did live a bit of a ways away from the schoolhouse so he always left a bit early. He has never been late to class and doesn't plan on being late ever. Shady had a small bounce in his step as he made his way towards the shoolhouse. He was ready to get the day started. As Shady approached the Schoolhouse he saw Miss Cherrilee standing out front like she always did. He came up to her and gave her a friendly wave. [colour=#000080]"Good Morning Miss Cherrilee!" [/colour] Cherrilee smiled at Shady. "[colour=#800080]And Good Morning to you Shady. "[/colour] He then moved through the door and found his seat in the classroom. He looked around and saw that he was the first student in class. It made him smile. 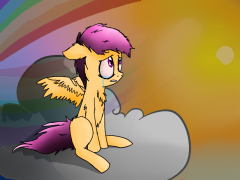 [Pictured above is Scootaloo in tears, sitting on a grey cloud. Rainbow Dash's trail is visible, hinted she might have just flown away. The sky is slightly dull but it appears to be nearing sunset.] Hello! ^_^ This is my first time posting my art onto the site, so I hope it turned out well. I spent one or two hours doing the sketch, lineart, colouring, and finishing the drawing. Please leave your comments, complaints, thoughts, and feelings in the comments section below. Have a nice day!